A 51-year-old woman who was a smoker presented to our emergency department with acute respiratory distress. Two months previously she had developed dyspnoea aggravated by exertion and a dry cough. Orthopnoea, leg oedema and resting dyspnoea had deteriorated 3 days prior to this presentation. There was no chest pain, fever, anorexia, abdominal pain or body weight loss. On examination she was obese and normotensive. A non-rebreathing oxygen mask was necessary to maintain her oxygen saturation (Spo2) at >90%. She had diffuse lung crackles, elevated jugular veins and pretibial pitting oedema. There was no heart murmur or gallop sounds. The ECG showed sinus tachycardia of 115 bpm. Routine blood tests showed no remarkable findings except D-dimer of 2019 ng/mL. The serum procalcitonin level was normal. Chest radiography showed a bilateral alveolar pattern, compatible with pulmonary oedema (figure 1A). CT showed no lymphadenopathy or pulmonary embolism, but a thickened interlobular septum mixed with ground glass opacities (figure 1B). Cardiac sonography showed normal left ventricular systolic function but leftward shift of the interventricular septum. Right heart catheterisation measured systolic pulmonary artery pressure of 68 mm Hg, pulmonary capillary wedge pressure of 10 mm Hg and cardiac index by the thermodilution method of 3.2 L/min/m2. All microbiological and immunological surveys showed negative results. The lung patches in the chest X-ray and the arterial oxygen tension/fractional inspired oxygen ratio improved initially after the administration of diuretics and mechanical ventilator use but deteriorated over the following days. (A) Chest X-ray showing patterns of pulmonary edema. (B) CT scan showing thickened interlobular septum (arrows) mixed with ground glass opacities distributed along the bronchovascular bundles. What is the diagnosis and cause of death? Pulmonary tumour thrombotic microangiopathy (PTTM). Signet ring cells were identified on pleural effusion cytology. Gastric endoscopy showed a 5 cm irregular ulcer at the posterior wall of the antrum and the biopsy confirmed adenocarcinoma. Two weeks later the patient died of progressive hypoxaemia and right heart failure. 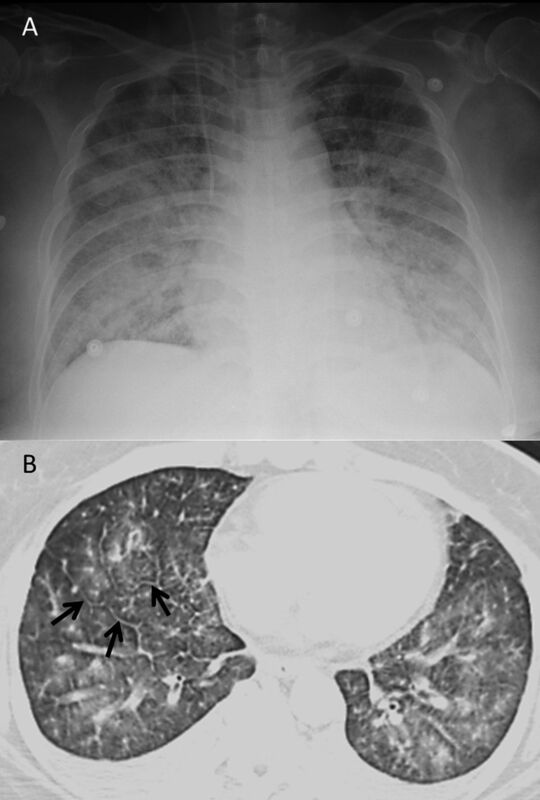 Necropsy of the lung confirmed the diagnosis of PTTM (figure 2). Obliterated arterioles with fibrointimal proliferation and tumor emboli (arrows) (H&E, ×100). Contributors Y-TC cared for the patient, formed the clinical reasoning and wrote the article. W-KW cared for the patient. Y-HH made the pathological diagnosis and contributed microscopic pictures.